Young people across Coventry will have their voices heard as part of the response to the Knife Angel being in the city. The Coventry City of Culture Trust is calling all young people, from five to 25 years, to share their responses to the Knife Angel and to use their creativity, passion and skills to educate and inspire their peers to help shape a better city for everyone. The 27 ft sculpture arrived at Coventry Cathedral earlier this month (March 14) and has received an overwhelming response from the city. 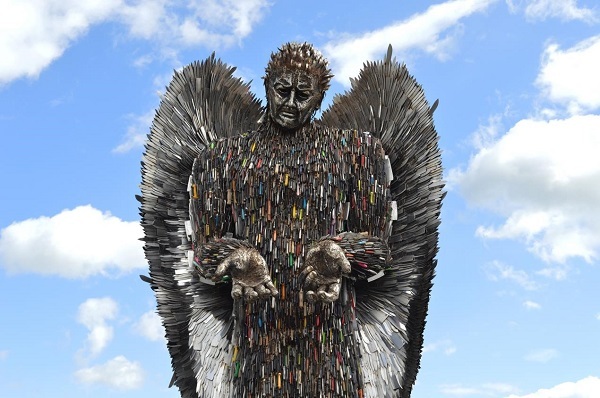 The sculpture, made of 100,000 confiscated knives, has been backed Coventry City Council, the Coventry City of Culture Trust, Coventry Cathedral, Coventry Police and the European City of Sport 2019 initiative. And now, organisations from across the city will begin conversations with young people on their responses towards the sculpture and the wider portrayal of young people in society. That work is being led by the Coventry City of Culture Trust and will see the responses of young people feature in a video that will be streamed during the Knife Angel’s stay in Coventry, which will be screened inside Coventry Cathedral. Chenine Bhathena, Creative Director of Coventry City of Culture Trust, said: “The Knife Angel has provoked conversation about knife crime and the different challenges our young people face in 21st century cities. “We want to hear from young people. This is your city, tell us about your life, what inspires and excites you, your interests, your worries and the big issues. Send us your messages by email or short YouTube clips – this could be illustrations, drawings, poems, comedy, a piece of music or performance, or a simple message. “The conversation needs to stretch further than knife crime. We want to understand how you, as young people, feel you are portrayed and seen by wider society, so that we can build a programme with you that reaches well beyond 2021 and that really captures the energy, playfulness and curiosity of our younger citizens. One of the partner agencies, Positive Youth Foundation, works with young people across the city on a range of services on a day to day basis, including a Staying Safe programme which is educating school pupils and professionals on matters relating to violence affecting young people. Rashid Bhayat, Chief Executive of Positive Youth Foundation, said: “We have to ensure that we don’t stigmatise a generation of young people and that’s why we want this conversation to be real and honest but also, equally importantly, look to find out what gives our young people a sense of pride and what positive contributions they are making across the city and beyond. “The issue of serious violence affecting young people is very real, which is why the Knife Angel was brought to the city. The Knife Angel was created by artist Alfie Bradley as employed and commissioned by the British Ironwork Centre in Oswestry, Shropshire. It will stand at Coventry Cathedral until April 23 as a physical reminder of the effects of violence and aggression. The Knife Angel’s time in Coventry has been supported by West Midlands Police, Coventry Cathedral, Coventry City of Culture Trust, Coventry City Council, Positive Youth Foundation, Medwell Hyde, Deeley Group, Norman Hay, WM Housing Group, Wasps, Absolute Services Group, National Express, Buckingham Group Contracting, Cadent Gas, The Coventry and Saltem Ltd. The Trust is looking for creative, imaginative films which demonstrate how young people can make a positive difference. Young people might express their ideas through film, comedy, animation, spoken word, music or just a simple message. They should be no longer than two minutes and can be anonymous if requested. Young people can send their films direct to knifeangel@coventry2021.co.uk or Whatsapp it to 07765 788249. Teachers and group leaders can collate the responses for collection.